It was barman's dawn. And I was still in the cot at 11 o'clock, worn out from talking s**te and pulling pints. There was a loud banging at the door. I ignored the knocking. I had had a few pints the night before. The column was done and I had a weekend off for the first time in months. I wrote about how Dublin should not be divided. Partition in Korea could lead to a nuclear holocaust but the breaking up of Dublin might be worse. Then there was a bit about making Dublin play semi- and quarter-finals in Cork and Thurles. But the banging continued. I pulled on my clothes as it's considered unmanly to wear pyjamas where I come from. The man at the door was wearing a Mayo jersey. He was in his eighties and he travelled from Mayo to Kerry to see me about a matter of grave importance. If the old man from Mayo is correct in his thinking, we can exclusively reveal that Mayo will be crowned All-Ireland champions in Lausanne later on this year. I asked him in and we had a cup of tea. The old man was stiff after the drive and his hand shook when he spooned the sugar. We will bring you back to last Sunday's All-Ireland football final. Dublin go into the lead and Mayo goalkeeper David Clarke kicks the ball out over the sideline. Time is nearly up. The Mayo man stated his case: "David had no chance of finding a Mayo receiver. According to Tomás ó Sé, four Dublin players wrestled four of our boys to the ground. So the rules state all four Dublin players must be sent off on a black card." Now I didn't see the alleged wrestling matches myself but for the sake of the argument we will take his word for now. The details can be sorted out in Switzerland. But only one Dublin player is sent off. And amazingly referee Joe Mc Quillan doesn't give a free to Mayo. Dublin are awarded a sideline and they keep possession until the final whistle. But then I have to tell the Mayo man I thought Dublin deserved to win. "They did not if right was right," said the old man and he banged our kitchen table as hard as if he produced the five of trumps to win a game of 25. I pour him a whiskey to calm him a bit. He apologises for losing his temper. So if Tomás is right there are four Dublin black cards. That much I get. But then I ask him what's this about Switzerland, which is not exactly a Gaelic football stronghold. "Well," said the pensioner, "Mayo should take the case to the Court of Arbitration for Sport (CAS) which is in Lausanne in Switzerland." We spoke for an hour or more and here's a summary of his thoughts. By the time David Clarke took that last free out, Dublin had already brought on Paul Flynn, Cormac Costello, Bernard Brogan, Niall Scully, Diarmuid Connolly and Kevin McManamon, which means Dublin had no substitutions left as six is the max. 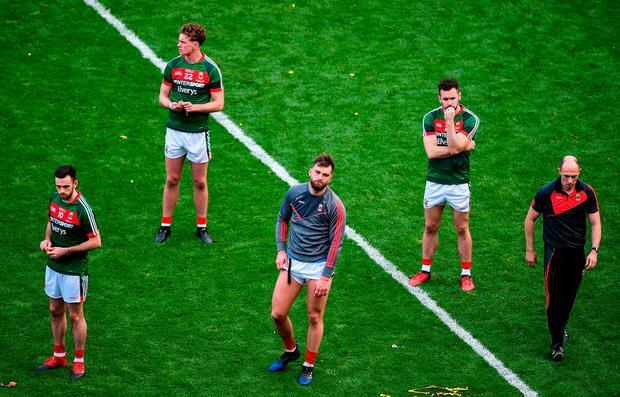 "They are down to 14 men and if the four black cards were given Dublin will have only 10 players on the field," said the Mayo advocate. The old boy's hands were still shaking. I didn't like to ask but I would say he has Parkinson's. I felt then I had to write his side of the story. He was of the opinion 'The Sunday Game' and many more bottled it. I ask, "why me?" And he replied I was very fair to Mayo all summer. When Mayo lost I felt as if my own county were beaten. "The game should have been abandoned," said the old man with the emotion raising up his slowed up voice, "or the final should have been awarded to Mayo." I checked up on his assertion after he left. I could not find any rule that states a team must have a minimum number of players on the field at any one time. But if Mayo did get a free, some 40 or so metres out from their goal, and Dublin were down to ten, with Mayo having 14 on the field, well then Mayo would surely have made a draw out of it. I asked him if he was going back to Mayo that day and he said herself was driving. They left home at seven that morning. "Stay the night," I say. "I have a bed for ye." But he declined as his wife was minding the grandchildren when their mam and dad went to work. "She's afraid you will put her in the paper." I walked the old man out to the car. His gait was hunched and his walk was slow. The car had even more mileage up than its owner. I promised his wife, who was a few years younger, I wouldn't say who she was. "We are quiet people," she said, "but this was eating him up so I said I'd drive him up to Kerry." I didn't have the heart to tell the Mayo couple there was hardly any chance of Mayo winning the first All-Ireland outside of Ireland since Cavan won in New York in 1947. And I do think Dublin would have won a replay as they were short of hard games going in to the final and so would almost definitely have improved for the outing. I don't think he was a bad loser. It's more of a case of a man in search of justice for his beloved Mayo. He lowered himself into the front seat. His wife put on the seat belt for him and off they went, very much together, headed for their home in Mayo. I'm just hoping they didn't make a another journey to the capital for yesterday's ladies final.